Of One Accord blends the sweet-sounding harmonies of good old-fashioned southern gospel music with a contemporary feeling to make each concert a musical experience. From old standards like Step Into The Water and Hide Thou Me to a host of new music, Of One Accord has a message in song for every one. The group makes its home in Frisco, Texas, just north of Dallas. Baritone-vocalist David McMahon and bass-vocalist Darrin Bruner co-founded the group in 2004 to reach the lost and encourage believers through the ministry of southern gospel music and their personal testimonies. Within a month, they added lead-vocalist John Graves. Two years later tenor-vocalist Ben Posey was added to the group. 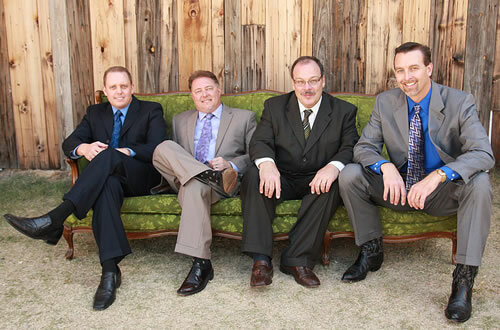 With John's departure to a new ministry career, the quartet added tenor/lead-vocalist Tim Posey. In that short time, the group has performed for local churches, at gospel festivals and home-goings, onstage at SGM Fan Fair, and in many National Quartet Convention showcases. Each member shares a deep love of southern gospel music. The timeless message found in these rich harmonies impacts each of their lives every day, and they want to share that message with others. With a rich diversity in backgrounds and sounds reminiscent of The Cathedrals and The Statesmen Quartet, the combination of all four voices blended together in tight harmonies has audiences sitting on the edge of their seats. This quartet truly has a sound unique in today's Southern Gospel music industry.